The following review originally appeared in the January, 2018, Bird Watcher's Digest. Birding is opportunity based. You never know what fortune will present. Waiting for your flight to board, looking out the large glass windows, across the tarmac, you spot… something. But it's a little too far away to identify. If only you could reach in your pocket for a binocular! That 10x42 or 8x42 masterpiece of optical excellence sitting safe at home, or buried in a carry-on bag, is useless now. A binocular that you always have at hand is just the ticket. Have you ever had a friend over who doesn't have binoculars, and you want to go for a walk? It's frustrating to share binoculars. An extra pair can save the day. Pocket binoculars are light and easy to carry. You can give your friend a good first experience of the joy of birding. This review looks at 14 pocket sbinoculars, none of them larger than 8x28, in all price ranges, from the high end to the remarkably inexpensive. We wrote individual reviews of 10 pocket binoculars that we deemed worthy of special note. If you are thinking about enhancing your birding toolkit, this article can help you find the pocket binocular that's right for you. Both Sides – Hinges on both sides: a connecting bridge has a separate hinge for each barrel. The focus knob is in the center of the bridge. Ten of the 14 pocket binoculars in our study have this design. One Side – One hinge on one side: the connecting bridge has one hinge by the left barrel. The focus knob is located with the hinge on the left side of the binocular. This provides a more normal reach for the index finger of the right hand. The Zeiss Victory Pocket and the Vanguard Orros have this design. 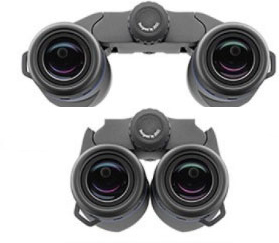 Standard Center – One hinge, centered between the two barrels, like most standard roof prism binoculars. 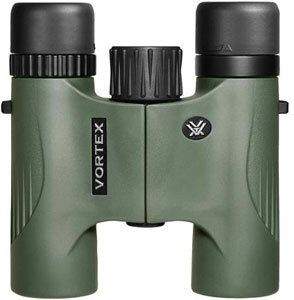 The Vortex Diamondback and the Celestron Nature DX have this design. Basically, these are scaled-down versions of their larger brothers, and they don't fold as small as the other compacts. Michael and Diane Porter studied the binoculars over a period of several weeks. We tested their optical performance and noted the ergonomic qualities of each one. We also invited a group of local Iowa birders to act as judges for a test day. The judges compared each binocular to the others, argued their merits, and reported what they liked and disliked about the binoculars. We include the judges' evaluations and comments in the individual descriptions and incorporated their judgements in the scores. 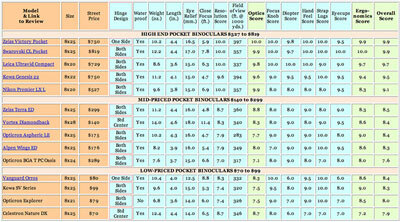 We include detailed reviews of 10 pocket binoculars of particular merit. The chart includes info and scores on all 14 of the binoculars in the study. The chart organizes the binoculars into three groups, according to price range. Each group is internally sorted by Overall Score. CLICK THE MINI CHART to see it full sized. The scores are consistent across all three groups and can be compared to one another. However, these scores are not scaled the same as scores on other reviews we have done in the past and hence cannot be compared to scores that appear in previous reviews. The Column Scores – The top score we gave for each parameter was a 10. 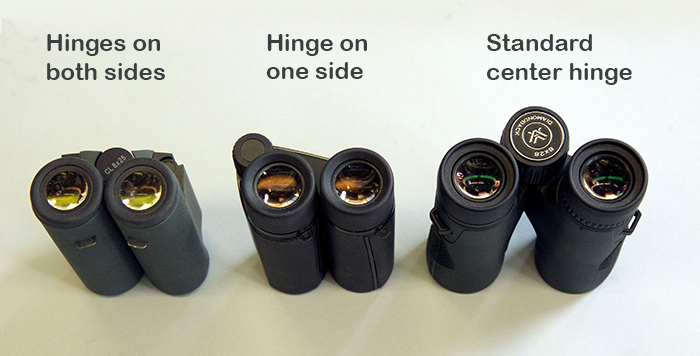 Size – All the pocket binoculars in our test were 8 power. 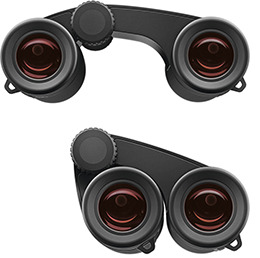 These binoculars are also available in 10 power versions. Street Price – These were the prices we found advertised at the date of this writing. As of your reading, the prices may have changed. Hinge Design (Both Sides, One Side, Std Center) – See above for details. Weight – We weighed the binoculars on a postage scale, without their caps, straps, and cases. The weight was not used in calculating any of the combined chart scores. Eye Relief – The eye relief specifications are from the manufacturers. Eye relief is the maximum distance (in millimeters) from the eyepiece that your eye can be and still see the whole field of view. It's important to birders who wear glasses. Since glasses can vary a lot in how close the frames will let your eyes get to the binoculars, it's best to test binoculars with your own glasses. 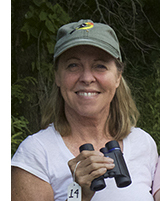 Even birders who do not wear glasses can benefit from having the eyecups adjustable. You want to steady the eyecups against your eye sockets and customize the length to fit your face. Besides, someday you might be wearing glasses. Eye relief was not incorporated in any of the combined chart scores. Close Focus – We tested close focus using Michael's eyes. The chart shows our measurements rather than the manufacturers' specs. Close focus was not incorporated in any of the combined chart scores. Resolution – We used a standard optical resolution chart brightly lit, a heavy-duty tripod supported by a stone floor, and a beanbag mount which let us compare binoculars side by side. The raw measurements from testing were mapped to the resolution scores in the article's chart. The highest score was mapped to a 10. We measured each binocular many times. After ranking them, we looked again at those with similar scores to see if we could detect any slight differences. We continued until we were confident of our accuracy. Field of View (FOV) – We were surprised to find that the manufacturers' specifications of FOV were wrong on several binoculars. Did some marketing guys have an issue translating from meters to feet? Or does each manufacturer have its own way of measuring field of view? Since the field of view is part of our optical scoring, we thought it best to measure this ourselves. We used a 4-foot rule and measured what we could see from edge to edge at a certain distance. Then we projected what this would be if the distance were 1000 yards. Although our specs may differ from the manufacturers' published FOVs, our FOVs were all determined the same way and hence can be compared to each other. Focus Knob Score – The focus knob is in constant use and is one of the most important ergonomic elements of a binocular. We judged each focus knob on smoothness, lack of slack, finger friendliness, and how comfortable it was to reach. Diopter Score – The diopter adjustment lets you fine-tune the focus for each eye. A good diopter setting should be easy to set, easy to see the setting, and hard to accidently move off the setting. A setting that locks is best. The Leica had the most elegant diopter setting design by far. Hand Feel – How does the binocular feel against your skin? Is it easy, secure, and comfortable to grip? How well does it fit in the hand? Since people's hands differ, we gave a lot of consideration to the comments our judges made. But ultimately, this is a somewhat subjective evaluation. Strap Lugs – Some people are annoyed by strap lugs that stick out and poke into their hands. Others are not. Some designs are better than others in making the strap lugs more hand friendly. Eyecups – Most of the eyecups twist up and down to set the right distance from your eyes to the eyepiece. Exceptions were the Leica Ultravid, which pushes straight in and out, and the Vanguard, with its older style, fold-down rubber eyecup. We rated eyecups on how smoothly the adjustment worked and how reliably they held their setting. Optics Score – The Optics Score combines the Resolution Score and the field of view (FOV), with heavier emphasis on resolution. A wider FOV gives the experience of better immersion in the scene, as well as making it easier to spot a bird. Ergonomics Score – This score combines the Focus Knob, Diopter, Hand Feel, Strap Lugs, and Eyecups scores. The Focus Knob score was weighted the most heavily. 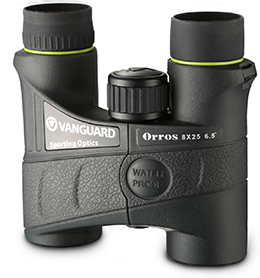 Overall Score – This score combines the Optics Score and the Ergonomic Score to give an overall ranking of all factors. All calculated or mapped scores were rounded to one decimal place, with a top possible score of 10.0. Numbers in a chart can take on an inflated impression of objectivity. The difference between two close scores might be within the margin of error. For example, small differences that we detected in resolution testing may not be noticeable in the field. Furthermore, we had only one sample of each binocular to test, and that one could have been atypical. Ultimately, how a binocular fits, feels, and handles might be more important to you than a small difference in resolution. No one but you can say how well a binocular suits your needs. 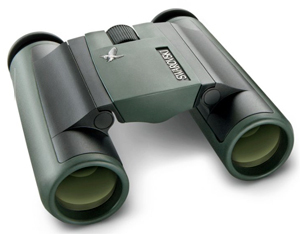 Here are some individual reviews, with detailed descriptions of the binoculars. The Zeiss Victory Pocket 8x25 tied with the Swarovski CL Pocket 8x25 for overall score and for resolution. It was in a four-way tie for the highest resolution score with the Swarovski, the Leica, and the Nikon. What edged the Victory's optical score ahead of the others was its outstandingly wide field of view. Ergonomically, our judges found the Zeiss design exceptionally comfortable. The strap lugs don't poke, and some of really appreciate that. The focus knob is large, with an action that is smooth and precise, with no lag or slack. The eyecups twist in and out but have no indents. The diopter adjustment is on the front end of the bridge, opposite the focus knob. Its markings are black on black, which makes them hard to see, but it has strong tactile click that lets you set it to the default zero position. This binocular is a 2017 redesign of the previous Zeiss Victory Pocket, which was an 8x20. This one is an 8x25. Like its predecessor, it features an asymmetrical, one-hinge design with the focus knob closer to the left barrel. It provides a more normal reach, allowing the index finger to fall naturally on the focus knob, similar to a larger, full-sized binocular. It works for the right index finger of average-to-large hands, and for the left index finger for small hands. In addition to a transferable limited lifetime warranty, which covers workmanship and materials, this binocular is also covered by a no-fault policy, in which Zeiss promises for the first five years of ownership to repair or replace the binocular at no charge if it is damaged during normal, intended use. The no-fault policy is not transferable. 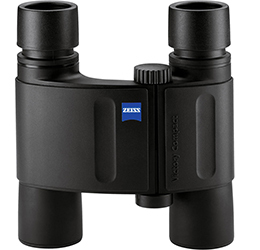 The Zeiss Victory Pocket binocular is available in 8x25 and in 10x25. Both models are the same size, shape, and weight. 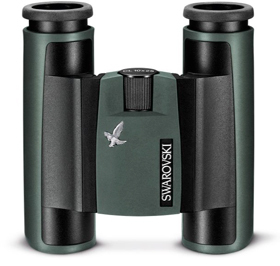 This small Swarovski binocular tied with the Zeiss Victory Pocket 8x25 for top overall score. For comfort and ease of use, the CL Pocket outdid all our other pocket binoculars in ergonomics, slightly edging out the Zeiss Victory. The CL Pocket's barrels are smoothly textured and comfortable to hold, with enough length that your last finger or two can wrap around the end of the barrel. It's substantial enough to fill your hand, yet it's small enough that you would never leave it behind. The focus knob turns smoothly and easily, with no slack. It can be turned either with a finger from the top or with a thumb from below. The strap lugs are small and close enough to the eyepieces that they don't poke your hand. 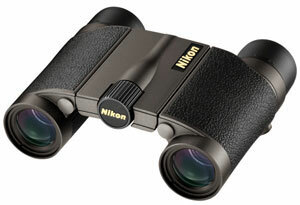 The eyecups, which twist out easily, are a grace note of this binocular. There are no big indents, but rather many tiny, granular ones that transmit a subtle vibration as they turn. They hold the eyecups setting at any precise position. The diopter adjustment knob is under the bridge, near the front. It's firm enough to hold its setting, and the location protects it from getting bumped or changed accidently. The two-hinge design folds the barrels flush together under the bridge, making it a very small package for such a hand-filling binocular. CL Pocket binoculars bought in North America carry a limited lifetime warranty on the optical system. The warranty does not cover accidents, fire, or neglect. 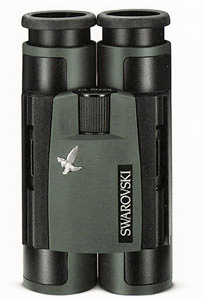 The Swarovski Pocket binocular is available in 8x25 and in 10x25. Both models are the same size, shape, and weight. In pocket binoculars, small is beautiful, and the Leica, at 3.7 inches and weighing just 8.6 oz., is the smallest and lightest of all the high-end pockets in our test. It's a two-hinge design, folding to 2.6 inches wide. It fits a small shirt pocket. The Leica tied with the Nikon, the Swarovski, and the Zeiss Victory for best resolution. The only reason it didn't earn the maximum optics score was that the other top contenders offer a wider field of view. Our judges liked the ergonomics, especially the single knob for both focus and diopter adjustment. The focus knob is long, extending back from the bridge. It's finger friendly and easy to locate. The small strap lugs don't bother the web of the hand. 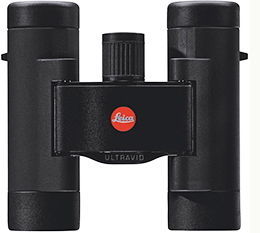 A glory of the Leica Ultravid Compact is its elegant diopter adjustment mechanism. On the end of the focus knob, a dial displays the diopter setting with white indicators. To change the setting, you push a small button beneath the bridge, letting the focus knob adjust the diopter. Your setting is always on display, and it's locked. We scored the Leica as having the best diopter adjustment mechanism. The eyecups pull in straight and out, without indents. Leica reports the binocular's eye relief as 15mm. It seemed to work fine with our judges' glasses. Leica's lifetime warranty against defects in manufacturing and materials is transferable. In addition, in the US there is a non-transferable 3-year no-fault warranty, which covers accidental damage. This is Kowa's top pocket binocular. The optics use XD glass. The Genesis scored slightly lower than the other high-end binoculars on our resolution tests. However, it has an unusually wide field of view, about the equal of the Zeiss Victory. Also, we measured its closest focus as only 4.7 feet, which was a tie for minimum focus distance. The eyecups, which our judges deemed among the best in the study, twist out smoothly, with three indents. The diopter setting is a knob located at the front end of the bridge. It's clearly marked with white lines and has an obvious zero setting indicator. Several judges remarked how good it felt in the hand. The manufacturer's limited lifetime warranty for materials and workmanship is not restricted to the original owner. The warranty does not cover accidental damage. This binocular is tiny and will slip into a small pocket. In resolution, it equaled the Swarovski, the Leica, and the Zeiss Victory, though with a noticeably narrower field of view than the either the Zeiss Victory or the Kowa Genesis. Nikon specifies the eye relief as 15mm, but it seemed usable to our glasses-wearing judges. Its main ergonomic issue is the location of the focus knob at the far end of the bridge. You can't use it with your index finger. Your could get used to it, but our judges expressed reservations about using their least adroit finger to focus. At the eyepiece end of the bridge is the diopter adjustment. It's a small, knurled knob clearly marked at the center point and with a simple scale. It's easy to see the settings. And it's stiff enough that it won't change accidentally, even though there is no lock. The rubber eyecups twist up smoothly to accommodate users who do not wear glasses. Although there are no indents, you can set the distance wherever you like. This Premier is the least costly model in our high-end pocket binoculars. Nikon offers a lifetime warranty against defects of material or workmanship. In addition, a no-fault repair or replacement warranty covers accidental damage. The Zeiss Terra got the top overall score in the mid-priced category. With one of the widest fields of view and one of the closest minimum focus distances, this binocular maintains the virtues of full-sized binoculars in a pocketable size. Your hands feel as if they are holding a regular binocular, and the focus knob is in the intuitively expected place, at the top of the bridge. The covering armor is grippy. Eyecups, knobs, and hinges move smoothly and an appropriate degree of resistance. The eyecups have no detents but have enough friction to hold their setting. Look at the other end of the bridge for the diopter adjustment knob. The knob's center default position is difficult to see, marked by tiny black-on-black symbols and lacking any indent at the center position. However, the knob is not too difficult to turn, and the out-of-the-way placement prevents its being accidentally bumped out of position. Zeiss's transferable, limited lifetime warranty covers defects in workmanship or materials for the life of the product. 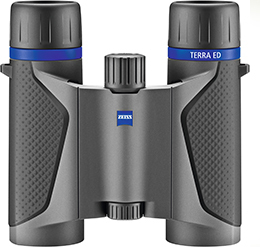 The Zeiss Terra ED Pocket binocular is available in 8x25 and in 10x25. Both models are the same size, shape, and weight. With its 28mm objective lenses, the 8x28 Vortex Diamondback is the biggest and heaviest of the small binoculars in our study. It's a normal binocular design, with a single, central hinge. One might argue that it is not really a pocket binocular. For many birders, however, it's light and comfortable to carry, even though it won't fold to pocket size. This is a rugged little binocular, with a grippy surface and a solid feeling. One of our judges found the focus knob and center hinge somewhat stiff, though the other judges found it comfortable to turn. Two of the judges remarked that the lugs poked their hands, but this did not bother the others. The eye relief of 18mm is the longest eye relief of any binocular in the study, and it should provide the full field of view no matter the user's glasses style. The eyecups twist out with indents and a precise, pleasant action. Vortex Optics warrants material and workmanship. It also promises to repair or replace the binocular if it suffers accidental damage. This unconditional warranty is transferable and does not require the user to register the binocular. If you like a binocular whose lugs do not poke your hands, you'll appreciate this one. It comes with a cord strap built into the binocular. Lugs are not necessary and are not there. It has the double-hinge design, with the focus knob in the center of the bridge. The focus knob is knurled and wide. One of our judges liked the smallness and the action of the focus knob so much that she chose this as her favorite binocular of the entire group! The diopter adjustment on the right eyepiece has a bump that serves as a lever for moving the mechanism, and it works well. We calculated a field of view of about 283 feet at 1000 yards, which was the narrowest field of anything in the study. However, it focused for us at 4.7 feet, which put it in a first-place tie with the Kowa Genesis for close focus. It's good for looking at butterflies or fine structures of flowers. 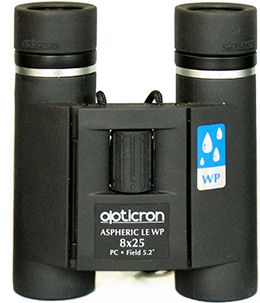 Opticron Aspheric binoculars are under Opticron's limited lifetime warranty, which covers optical and mechanical components and outer protective armor. It also comes under a premier warranty that covers accidental damage up to 5 years, not including loss, theft or deliberate damage to the instrument. The Alpen Wings 8x25 is tiny. We weighed it at only 8.2 ounces. It folds up small enough to fit in a man's shirt pocket. The eyecups twist out with a couple of indents, and the motion is particularly smooth and precise. The eye relief of 16mm seems sufficient for most glasses wearers. Alpen placed the strap lugs on the underside of the binocular, where they don't poke a person's hands. The diopter adjustment mechanism, a knurled ring on the right eyepiece, offers an ideal degree of resistance and includes a red dot at the center point to make it easy to check your setting. The focus knob is at the far end of the bridge, like the Nikon's, where it is turned by the ring or little finger. The binocular's ergonomics score suffered somewhat because of that. Otherwise, the Alpen Wings feels comfortable in the hand. Alpen offers a lifetime warranty against manufacturing defects, as well as a no-fault warranty. In case of any problem, including accidental damage, Alpen promises a one-time free repair or replacement. 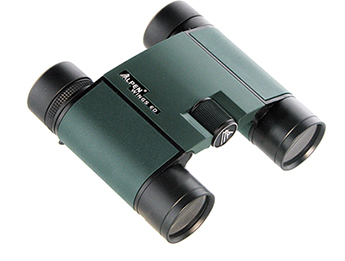 The Alpen Wings pocket binocular is available in 8x25 and in 10x25. The Vanguard Orros received the top overall score in the low-priced category. This $80 binocular is a real find, at least for a person who does not wear glasses. Like the Zeiss Victory Pocket, the Orros's hinge and focus knob are asymmetrically positioned to the left side, allowing the choice of a relaxed, natural, index finger reach from the right or a shorter reach from the left. The two barrels fold together almost flush, so even a person with close-set eyes or a small child would be able to see through both eyes. 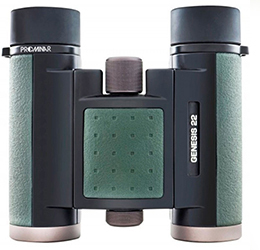 The Orros was one of four binoculars that got a perfect 10 for its focus knob score. Unfortunately for some, the eye relief of 12.5 mm. is too short for a person wearing glasses. However, for non-glasses wearers, the short eye relief does not matter at all. Another issue was the diopter adjustment ring, which turns a little too easily. A user would need to check the setting often to make sure it was still correct. The old-fashioned, rubber, fold-down eyecups cost the binocular on its ergonomics score. However, they are easy to flip, and they do stay where you put them. Textured, rubberized armoring makes the binocular grippy and pleasant to hold. One of our judges thought it had the best feel of all. The strap lugs are particularly comfortable, as the barrel swells out to encompass them. At 10 ounces it is not heavy to carry, and the mechanics work smoothly and easily. This would be a great choice for kids, as long as they don't wear glasses. The Vanguard warranty includes accidental breakage or damage. Pocket binoculars, because their barrels can be squeezed so close together, may be the only binoculars that will work for young kids or for a person with close-set eyes. They are also ideal travel binoculars. The high-end models have optics as good as it gets, so you can go light and still not miss out. In some travel situations you might not want an expensive item dangling from your neck. Your pocket binoculars can easily be concealed but always there when you need them. You'll never leave them back at the hotel. Pocket binoculars are a must-have for a backpacker, when every ounce counts. And, if you're a photographer, you want optics that don't tangle with the camera you're carrying. Pocket binoculars can deepen your enjoyment of all the serendipitous beauties and wonders that may befall you. With magic magnification in your pocket, you'll always be ready. All text and photos copyright Birdwatching Dot Com.